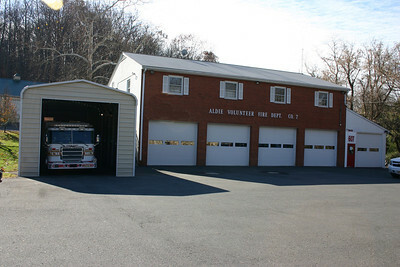 Aldie Fire Station 7, with the addition of the garage in 2010 to house Rescue 607. 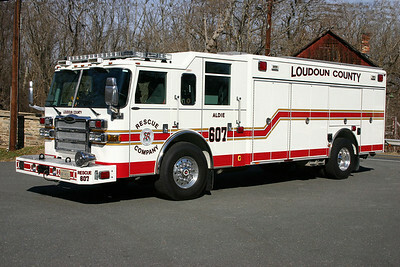 Loudoun County, Virginia Engine 607 is assigned to the Aldie station. 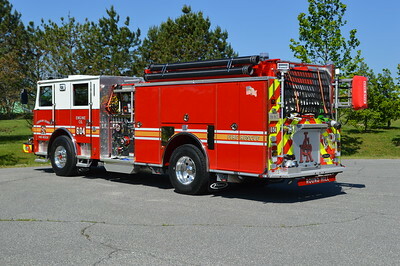 It is a 2015 Pierce Arrow XT 1500/750/50 and Pierce job number 28035-01. 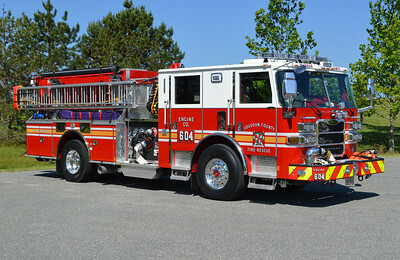 This Pierce was originally assigned to Engine 604 in Round Hill. In 2017, it was re-assigned to Engine 607. Photographed in July of 2015, Tanker 607 from Aldie is a 2005 Smeal Sirius, 1500/1760/40A, SN# 3013. 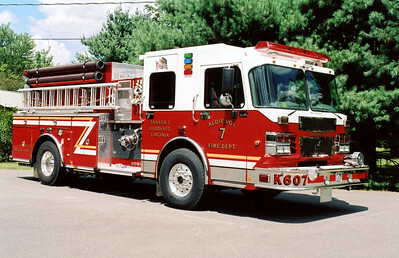 The officer side of Tanker 607, or "K607" as designated on the front bumper. Tanker 607 was taken to the Aldie Elementary School for photographs. 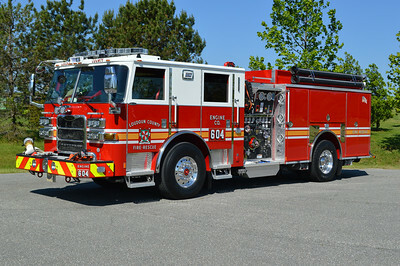 Aldie Rescue 607 received a new heavy rescue in 2011 when the county placed into service this Pierce Arrow XT. 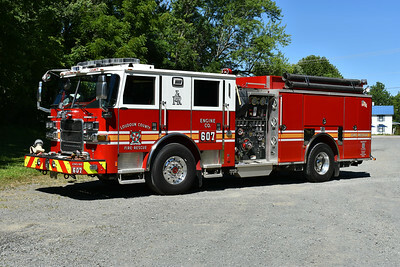 The new Rescue 607 replaced an older 2007 Pierce Dash that was originally Rescue 603 in Middleburg and then transferred to Rescue 607 in November of 2010. With the addition of the 2011 Pierce Arrow XT, the older 2007 Pierce became the county reserve. Lt. Scott and his crew were very accomodating with photographs of the new Rescue 607 in April of 2012. The Pierce was taken to a golf course on nearby Route 15. In 2015, Aldie had Keplinger Repair of Winchester, VA, convert their utility into a brush truck. Brush 607 is a 2005 Ford F350 4x4/2015 Keplinger Repair, 250/200. Aldie's Utility 607 was this 2005 Ford F350 4x4 pick up truck with an unusual Knapheide cap. In 2015, the utility body was removed and a brush skid package was added. 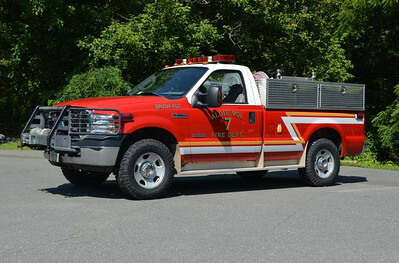 Work was completed by Keplinger Repair of Winchester, VA.
Aldie, Virginia in Loudoun County Utility 607, a 2015 Ford F350 and equipped by Keplinger Repair in 2016. 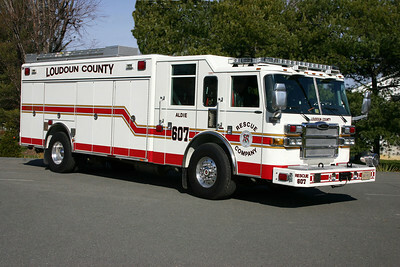 Engine 607 from Aldie is this 2007 Smeal Sirius 1500/750/20. It replaced a 1996 Pierce Dash engine which was sold to Sterling, Virginia and today runs as Wagon 611. 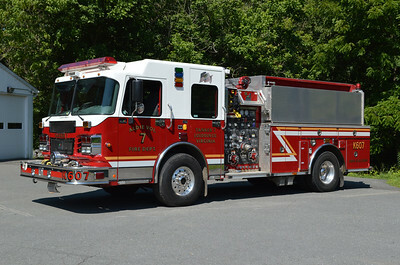 Engine 607 was photographed at a golf course in Aldie's first due in April of 2012. Sold to Haysi, Virginia (Dickenson County) in 2017. Photographed in September of 2017 in Winchester, Virginia the day before being delivered to Haysi, Virginia in Dickenson County. 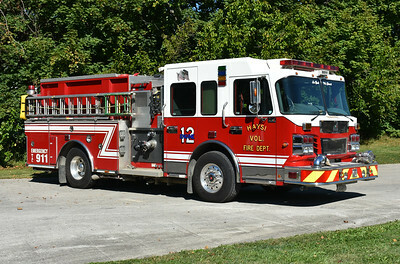 Engine 12 is a 2007 Smeal Sirius 1500/750/20 with s/n 703050. It was originally delivered to Aldie, Virginia in Loudoun County. Hasi, Virginia's Engine 12 officer side view. Needing a reliable reserve engine for the fleet, Sterling purchased this 1996 Pierce Dash 1500/750 from the Aldie Fire Station 7 in 2007. 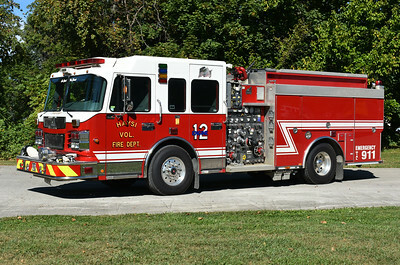 Sold in 2015 to the Upperville VFD in Fauquier County, VA.
Upperville's Engine 5 was originally delivered to Aldie, Virginia in Loudoun County. 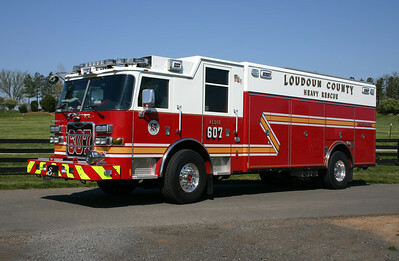 In 2007, it was sold to Sterling, Virginia (also in Loudoun County) where it was originally assigned as Wagon 11. Upperville purchased the 1996 Pierce Dash 1500/750 in 2015. 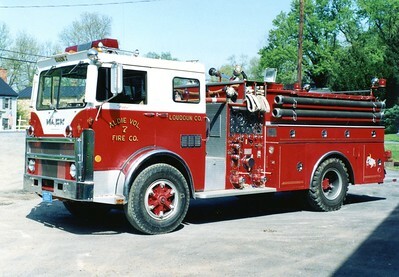 Former Wagon 7, a 1978 Mack MB/Oren, 750/750. Sold to a dealer in Alabama in 1996. 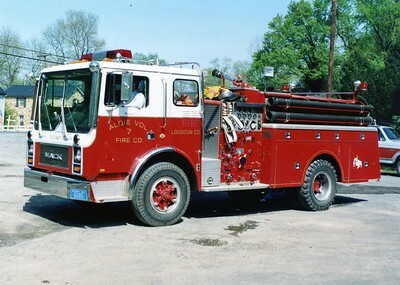 Former Engine 7, a 1981 Mack MC, 750/750. Sold to Cleveland, Oklahoma, in 2005. 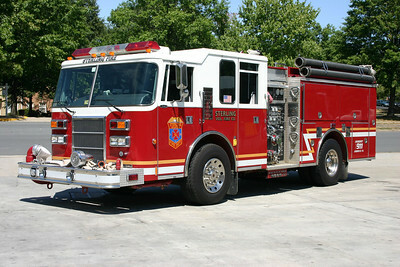 Former Tanker 7, a 1989 Mack MC/1979 Ward, 750/1250. Sold to a department in Wisconsin in 2005. 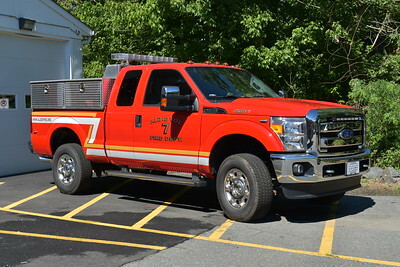 The driver side of Rescue 607 and photographed at the end of the ramp at Fire Station 7. I have a variety of old apparatus photographs from Aldie which have the old brown structure in the background. This Pierce Squad became the county reserve in 2011 when Rescue 607 received a new Pierce Arrow XT heavy squad. 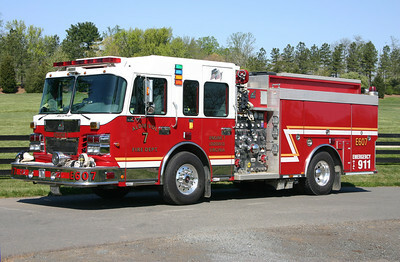 Rescue 607 was established in November of 2010 with this 2007 Pierce Dash. 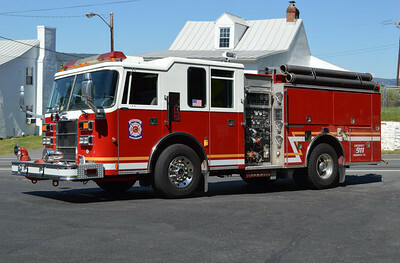 The Pierce was previously Rescue 603 in Middleburg, and came to Aldie when Middleburg discontinued heavy squad services. 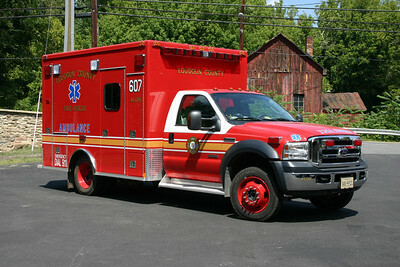 With the delivery of the newer Pierce Rescue, this unit became R680, the county reserve. Note the ladder storage on top of Rescue 607. Photographing apparatus at Fire Station 7 can be "tight". 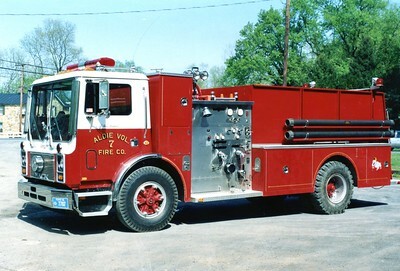 As with earlier photographs of Aldie apparatus, the crew took Rescue 607 to the Aldie Elementary school for some more room to move around for photographs. Brush 607, a 1980 Chevrolet Sierra Pick Up 250/200, was ultimately replaced in 2015. 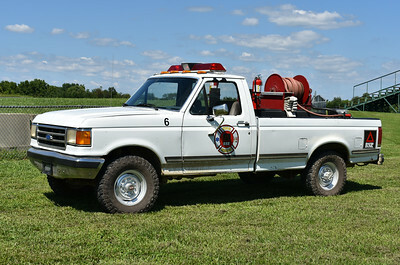 From Summit Point is "6", a 1988 Ford F/2016 FD with a 1980 skid unit (250/218). It was received in 2016 and the Ford came from the Motorsports Park. 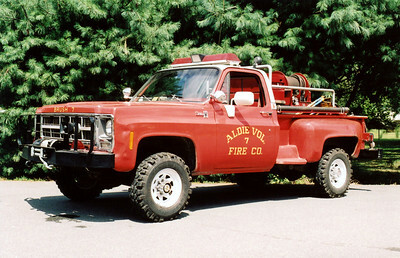 The skid unit came from Aldie, Virginia in Loudoun County. 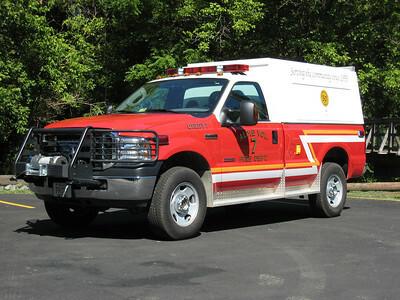 Former Medic 607 in Aldie is this 2006 Ford F450 4x4/Medtec. A similar ambulance runs at Neersville Station 16.